MANSFIELD (WTIC) -- Someone tampered with an American Flag that flies in Mansfield, Conn., and now the town is responding. On Sunday, Jan. 22, the flag flying in the Veteran's courtyard at the Beck Municipal Building was turned upside down. Town hall was closed for the weekend, but people alerted the nearby community center staff who were able to fix it. 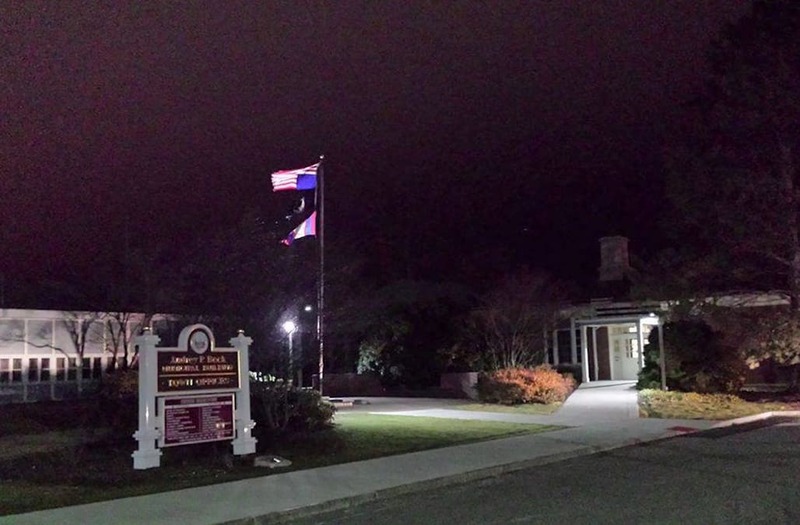 "The Town of Mansfield takes great pride in flying the U.S. flag in accordance with state and federal protocols, and condemns this disrespect shown to one of our national emblems," town leaders said in a statement. "We appreciate that this issue was brought to our attention and quickly corrected by our staff." Town Manager Matthew Hart said the allegation that the town government was involved in this is absolutely false. "We did not tamper with the flag," he said. "Thirty years ago I was wearing army camouflage serving our country, there are other veterans here too, that's something we would never do." Pictures of the flag surfaced on social media prompting many people to contact town leaders to get it fixed. Since then, Hart said the town has received threats, state police are involved. "I know this is the era of social media and things go viral so quickly, I just really would encourage people before you click the button to send your message, just really think about your actions and what you're saying online," Hart said. "We were very concerned to receive that allegation." According to U.S. flag code, turning a flag upside down should only be done as a signal of dire distress in instances of extreme danger to life or property. Community members weighed in, saying they feel this action was in protest to a Trump presidency. "A lot of opinions have been expressed over the new president coming in so it could have been due to that," Mandy Ivory of Ashford said. "I think it's very unpatriotic and unnecessary to do, you can express your opinions in other ways that don't involve reckless vandalism." "Regardless of how you feel about the election I think right now the most important thing for us to do is stay unified," UConn student Jayson Gilbert said. "We all need to kind of ban together and together make the country great."